Hey, there is arugula hiding in my eggs! I am a foodie. There is no hiding it. My step-mother, Suzi, tells me that as a kid, when we were eating breakfast, I would ask what we were having for dinner. I love the nurturing feeling that comes from food that comforts, and the crisp texture of fresh foods. I cannot tell you the number of meals that I have enjoyed at the hands of those who love me, and as such, I absorbed that love through every forkful. Changing the mindset of eating is not always easy. Behavioral change is just as difficult. I have found that when the evidence is clear, and reason is identified, making adjustments in habits become a little easier. After spending the better part of 15-18 years fatigued, uncomfortable, irritable, and quite honestly, depressed, all of my personal research pointed to the incredibly nutrient poor diet that I was ingesting. I survived on a large portion of carbohydrates, with a small helping of vegetables and a dollop of protein. What I thought was the thrifty way of eating, cost me more in valuable years than it would have ever saved me in money. There was an interesting cascade effect that began when I first started incorporating more vegetables and healthy proteins in my diet. First, I made a healthy meal choice. Then, my mind recognized that a good choice was made, and the happy “reward” hormone said “atta girl!” in my head. This sweet little happy hormone encouraged me to make more and more good choices, and even gave me the nudge to get active. The activity, of course, rallied in weight loss, as well as the occasional ravenous hunger spells from the calorie deficit. Remembering that happy feeling when good food choices were made, it kept me from digging into the former food habits. All of these things help in the course of sustainable weight loss and increased health. But be aware: If an indulgence creeps in, these things all work in reverse! Unless you quickly jump back on the program and keep trucking forward. I say this not to be a downer, but to remind us that we will have times that we allow ourselves the occasional splurge, and when that happens, we can take control of the situation and resume the path that we are headed on. As I transitioned into a healthier eating pattern, my mission was to eat no less than 5 servings of vegetables and fruit (combined) per day. If I had a day that I was more hungry than normal, I tried to train my brain to think of a veg or fruit that I could eat, rather than the normal filler foods like crackers, chips, etc. One thing that I am super thankful for during the last 3 years is that I have not been ill, even once. Not a cold, flu or anything (thank you, Lord). There have been a couple of times that it felt like something was trying to set in and I would quickly make a batch of Ginger Tea (hot water, 1 inch hunk of ginger, wedge of lemon & a tsp of honey), and whatever it was would leave. This is truly evidence that nutrition will assist the body in promoting wellness. When our cells are given the proper macronutrients, vitamins and minerals, the chemical reactions within the body work in proper fashion, building new cells, tissues and fighting off invaders as well as getting rid of dead or bad cells. All of these things take place without any acknowledgement on our part; the nutrients from food simply do their job. So, no longer is there a huge desire to consume food based simply on taste. Food serves a function, fueling the body, so that life is so much richer. Physical, mental and emotional health improves by eating whole foods. If your food comes from the Earth or ate from the earth, eat it. If it has undergone any form of processing besides washing, freezing, grinding or drying, you will do yourself a favor by limiting them to only about 1/5 of your total food consumption or less. Each step of processing removes another layer of nutrients, which your body desperately needs to stay in tip-top, disease-fighting state. The Blue Zones, Second Edition: 9 Lessons for Living Longer From the People Who've Lived the Longest, by Dan Buettner is a fascinating book that details the 9 common factors among the population of individuals who live to see 100 years of age. While that may seem like a lofty goal, these individuals seem to do it effortlessly with simple rules for life. I had the privilege to hear Dan Buettner speak at the 2013 Florida Dietetic Symposium and his research bolstered my insistence on making nutrition a priority. Eat fresh foods. Often. Don’t get discouraged if you try something for the first time and do not like it. Our palettes need the need the opportunity to acquire a new taste. The first time that I ate arugula I thought it was too pungent. It took about 3 times of trying it with different dishes before I finally decided that I LOVE it. Especially with balsamic vinegar! Challenge yourself the next time you go to the grocery or the market, to buy something that you have never eaten before and keep an open mind to it. Look up the nutrients of that food, and remind yourself that you are FEEDING YOUR LIFE! *Let me preface this post with a link to My Journey. I was not born a runner, nor have I ever had any significant athletic tendencies until 2011. If you think that you could never reach an accomplishment like a half marathon, think again. If I could sum up the process of training for my first half marathon in one word, it would have to be courage. Too often, I relate better to the cowardly lion than the lion-hearted. Big goals scare me speechless. I fear the long process, the unknown, and I fear failing. In the end, I know that there will not be anyone more disappointed in me, than me, if I fall short of the goal. And that is the major miracle and milestone that occurred in February of this year (2014). Not simply that I ran 13.1 miles for the first time in a race, but that somehow the courage to take on the task and be faithful to the training, so that I could meet the goal. There was a specific reason that I chose the Princess Half Marathon as my first, which goes beyond the fact that it was a fun Disney race. As a Daughter of the King (which makes me a Princess), recognizing just how much of a privilege and a blessing it is to have His strength offered to me as His child was/is part of my growing process. Though I am not “young” in the Lord, there are things that I learn every day that gives me a greater understanding of what He desires to do in my life. Running the Princess was an exercise in deepening my dependence on Him to lengthen my endurance. This was not a decision made on a whim. The Princess had been calling my name for over 2 years, but I was shy and afraid. It seemed like that was only something that elite athletes would do, not a less-than-three-year-runner would take on. My dear friend Angel had been encouraging me to jump in, but I was not nearly on her level of fitness and felt like, “sure, you think it’s easy… but not for me!” Because she has been my faithful fitness streak partner for almost 2 years, she said if I signed up, she would be right there with me. As an added bonus, my friend-that-is-more-like-a-little-sister, Dara, who had also taken up running signed up too! I knew it would be a big weekend, and having companions would make it even bigger! At the time of registration, in the summer of 2013, the farthest that I had ever run was 7 or 8 miles. My sister, Kim, kept telling me that if I could go that far, surely I could make 13.1. I still was not so sure. I kept up my weekly maintenance runs of 3-5 miles a couple times per week and did a “long run” of 6-8 miles at least 2 times per month. My long runs were maintenance runs for real distance runners, or so I thought. On October 29th, I started the suggested Jeff Galloway training plan that was offered on the Princess website. I loved the fact that it would download into my calendar on my phone so I always knew what my scheduled runs were. By this point in my running, I was not using any interval training apps, simply MapMyFitness/ MapMyRun. For a very long time, I depended on an app to tell me when to run and when to walk, because it gave me something to shoot for. If I left it up to myself to create intervals, I would probably not push myself as far as I could go. I felt like a big girl now, just hit the start button and go! There were occasions when I would walk a few paces during a drink break or at a turnaround point, but I for the most part it worked better for me if I kept the momentum going. Not everyone is the same, and many have found great success with Jeff Galloway’s walk/run interval method. You have to go with what works for you. During the Fall of 2013, while I was training, I was also taking a full load of classes and maintaining a crazy schedule with my kids. Lots of taxi time and even more time in the books. Running first thing in the morning seemed to set the day in order and gave me that great feeling of accomplishing a small goal at each run. I normally run with one earbud in (for safety), and listen to music or podcasts, but so many times I tuned out the music and worked on sorting out an issue at hand… exactly how many amino acids are there?... what are the names of the B Vitamins?... How is Hannah going to get to class tonight when Trent has practice?...Will Trevor be at work or school tomorrow? At the beginning of 2013, the main physical goal I had set for myself was to hit 13.1 in ’13. Even though the training plan did not suggest for me to run 13.1 yet, when I set out for the long run on December 28th, I ran my first 13.1. It was pure adrenaline! Up until this point, I had only done 10 miles. As soon as I turned off my app, my husband called to find out where I was (I had taken longer than the 11.5 miles that I originally told him I would run). He had planted a water bottle at a specific location for me earlier, and when I called, I asked him if he would start an Epsom salt bath for me. To my surprise, he said it was already done. When I got home, my daughter had a smoothie ready for me and he had some eggs and veggies waiting. I was so moved by their support of this goal that meant so much to me, and I was only still in training! January and February in Florida can be pretty chilly (I know, nothing like up north…), so making myself get out there in the cold mornings was sometimes a struggle. I did fairly well keeping to the training schedule, because I did not want to get to the race and fail. The last 2 long runs did not go quite as planned. The time needed for the long run was sometimes difficult during these mornings when the sun did not come out until after 7am. Saturdays were frequently filled with one activity or another, and we have church on Sunday. In order to get my miles in before the sun arose (since I did not have a running partner) my dear husband followed me in the vehicle, shining the headlights on the sidewalk and keeping me safe. At one point, he rode a little ahead of me. A shadow fell on the sidewalk ahead of me and I could not see the uneven pavement and I fell hard. I was carrying a hand-held water bottle, which I landed on, and it exploded all over me (yes, you can laugh… I did). I was soaked, scraped, and a little shaken, at only the 3rd mile of a 12 mile run. My husband jumped out of the car and made sure I was ok. There was a time in my life when I would have gotten in the car and said forget it… Instead, I gave him my wet jacket, had him refill my water bottle, and proceeded on. I think he was really concerned for me, because he followed me for a while, even after the sun was up. The very last long run was supposed to be 14 miles. It looked like it might rain, but I had no other time to fit it in so I headed out anyway, telling myself that I needed to be prepared in case it rained the day of the race. The first 5 miles were fine. Then the mist began….It was fine until about mile 8, and by mile 10 it was pouring. I huddled under a tree, hoping for it to pass. My hubby called and asked if I needed a pick up (how does he know the perfect time to call?). I finally conceded and he agreed to come and rescue me. Up until this point I was faithful to the plan. I believed in the plan, and I trusted that it prepared me for the race. I will say, I knew that I would not be a record setting runner. My average run pace for a long run was in the upper 10 min/mile or 11 min/mile range. I was perfectly fine with that pace. All that mattered to me was to finish strong. The fact that I had the courage to see it through the training plan was a major accomplishment for me. 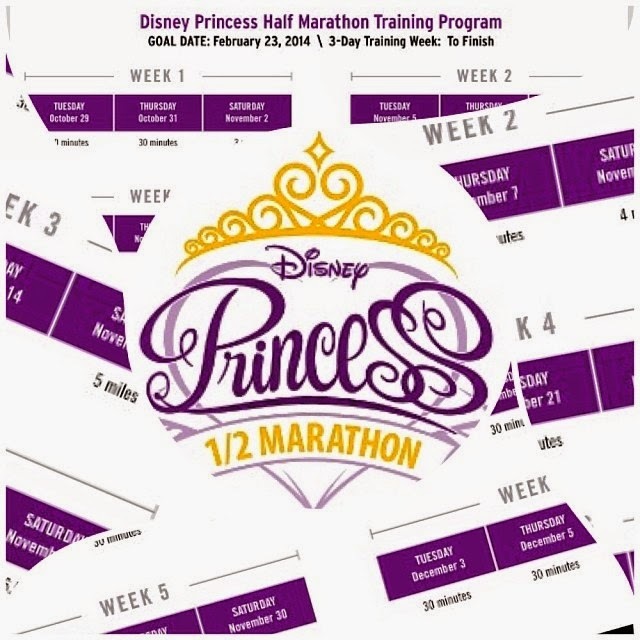 In the next post, I will share with you the fantastic experience of the Princess Half Marathon weekend. *Disclaimer: Please consult a physician before beginning any exercise plan. This is written as encouragement. Those of us that seek to lose weight come at it from varying perspectives. Some have struggled with weight for as long as they can remember, while others have noticed their weight creep up in their middle years, or after a major life change, or even a health emergency. We also approach a new healthy lifestyle with many different experiences in activity and exercise. This makes everyone’s starting line a little different. Let’s pretend that each and every one of us have begun at square 1, no prior physical activity experience, and hate to sweat. This is a very real position for many! This is not a judgment, this is a recognition. But our bodies were made for activity. Centurions (those who live to 100) have been studied to find their secret, and regular activity/exercise is a common thread that ties them together. We were created with the ability to tend to crops, care for children, and draw water from the stream. Today, we get our food from the grocer (in the air condition), the kids are in school and our water is pumped into our homes. Believe me, I love technology and the modern day conveniences, however, we cannot neglect the body’s need for movement. I have to tell you something, but you need to promise that you will not stop reading once you see it. Are you ready? Ok, here it is. Especially if you don’t like to sweat. (I fall into this category, no pun intended). It is hard mentally. It is hard emotionally. It is hard physically. The path of least resistance is not your freeway to success. It is the off-ramp to health misfortune. You have to prepare yourself for the battle that will go on in your mind and your body once you make up your mind to get healthy and lose weight. You have to remind yourself that you are making deposits in YOUR LONGEVITY ACCOUNT! Think about a year from now, 5 years, 10 years. If the Lord tarries, what sort of milestones will you pass? Will you be married? Will you start a family? Will your children be school-age? Will your nest be empty? Do you want to be an active participant in your life, or a spectator? This thought should stay with you, always. It is worth all of the “hard” that you will face. And one day, it will not be so hard. You will be thankful that you chose to kill the hill rather than go around it! The best way to start from scratch is to lace up your athletic shoes and head out the door before your mind can talk you out of it. Set a timer on your phone for 10 minutes and walk. Every. Single. Day. For the first week. If you have a smart phone, download an app like MapMyFitness, create a profile and track your activity. They offer challenges with a chance to win prizes as well! Each day, look at your pace and gauge how you feel after your walk. Try to do this as early as you can in the morning. This will get your happy endorphins going for the rest of the day, and you know that you have begun the day with a purposeful decision to get healthy. Not only that, but if the rest of your day gets carried away into the unknown, you have gotten it out of the way! This is a great time to talk about the Fitness Streak that I mentioned in part II of this series. The idea of the Fitness Streak is from the free diet tracking website Sparkpeople.com. I used this site to get the mojo going in my efforts to be healthier and lose weight. The basic idea of the Fitness Streak is to commit to exercise no less than 10 minutes per day, starting at day 1. Each consecutive day that you exercise at least 10 minutes counts toward your streak. If you skip a day, you start back at day 1. You would not believe the fantastic incentive it offers once you have made it past 14 days, then a month, and then a year. Currently, I am on my 3rd Fitness Streak. During the first two, I made it well past 100 days, and the current Streak I am teamed up with a great partner, my friend Angel. We are on day 726 1111 today. We do not see each other daily, as we live in different cities, however, we post our daily activities on a Facebook group that helps to keep us accountable to one another. There have been some days when life is crazy and I realize after I have snuggled into bed that I forgot to put my 10 minutes of exercise in, and I will peel my sleepy self out of bed to do a 10 minute exercise video or yoga. My flesh hates it, but the next morning I am glad that my Streak is still intact! Having a partner who is depending on you to keep your joint Streak going is a really good incentive! After the first week, increase your time by at least 5-10 minutes, 3-5 times per week, (continuing at least 10 minutes on the remaining days) until you are able to walk comfortably for at least 30-45 minutes. Research shows that during the first 15-20 minutes of exercise, we use stored glycogen (fuel), but after that we begin to tap into our fat reserves. Something else begins to happen as this daily habit develops; your muscles begin to develop strength and your stature is a little more upright. You may begin feeling winded quite quickly, but with time you can easily manage to even have a conversation during exercise. This all may sound basic and elementary, but it is so important to speak right at the intimidation that we encounter when we begin this new active lifestyle. There may be times that you experience discomfort in limbs or areas of your body due to the new movement. Listen carefully to your body to determine if it is discomfort or pain. One may be from uncharacteristic use and the other may indicate an injury. You may always enjoy walking, and that may be your primary form of exercise; keep in mind that strength training will help to maintain bone density and build muscle to support your frame. As you become stronger, consider using small weights for arm exercises, or use your own body weight as resistance as you do wall-pushes. If you are anything like me, you may look for exercises that will have the largest amount of impact on your weight loss for the shortest amount of time invested. This, in fact, was the reason that I started running. Before you tune me out, listen; I, Tasha Brickhouse, was the girl in school who, when asked to complete the physical fitness test and run the mile quickly became ill and asked to go to the nurse. Every. Single. Time. Running ranked right up there with dissecting frogs in Biology. They both left me breathless and ready to hurl. For some reason, while I was on the Sparkpeople.com website reading all of these middle-aged people beginning a Couch-2-5k program, I was like, “Game ON!” I had already been walking up to 3 miles regularly, so I didn’t exactly start on the couch, but, I had zero previous running experience. Somewhere in my determination to get healthy, I made up my mind that I would conquer this fear of running head on! And I did! The first step was to download the Ease into 5K app. It started with a walking warm up, then a cycle of short run then walk intervals. The first day, I was exhilarated and exasperated. It was hard to breath, and I prayed for the prompt to walk at the end of every interval. The day that I ran 3 minutes straight, you would have thought that I completed the Boston Marathon, because to me, I was crashing down walls with every step. The app really made the transition to running my first 5K in November 2011 possible. I was not speedy, but I ran the entire race and it was such a personal milestone! Running became an opportunity to learn more about endurance. It taught me how to breathe deeply and slowly through the tough spots (in life, as in running). It has taught me that discipline trumps desire. It has shown me that I can be tougher than I thought I am, especially when I am strengthened with prayer. The repetitive motion of running brought order to my thoughts, established a designated quiet time when the Lord could help me work out a difficult situation. I listened to Podcasts, encouraging music, or sometimes just the breeze in the trees. I’ve seen more sunrises, watched the fog lift and seen the dew glisten on the trees. These simple things are missed so easily. There are many other forms of exercise that are worth a try. One of my favorite is Barre. It is a combination of yoga, Pilates and ballet. The techniques are great for increasing balance, poise, and muscle tone. I began using this YouTube video, and you can also go to the Barre3 website to sign up for an online membership that gives you access to a library of videos. Barre studios are cropping up all over the place, and some may enjoy a class setting. For my on-the-go schedule, it works better for me to do them at home. We have a weight machine and resistance bands that I use for cross-training days. I mentioned yoga earlier, and I believe the techniques used in yoga exercise are very beneficial for the body. Personally, I do not participate in the spiritual aspects of some yoga practices, however, the act of breath control in exercise can eliminate toxins from the body, and offer needed relaxation and strengthening to our physique. 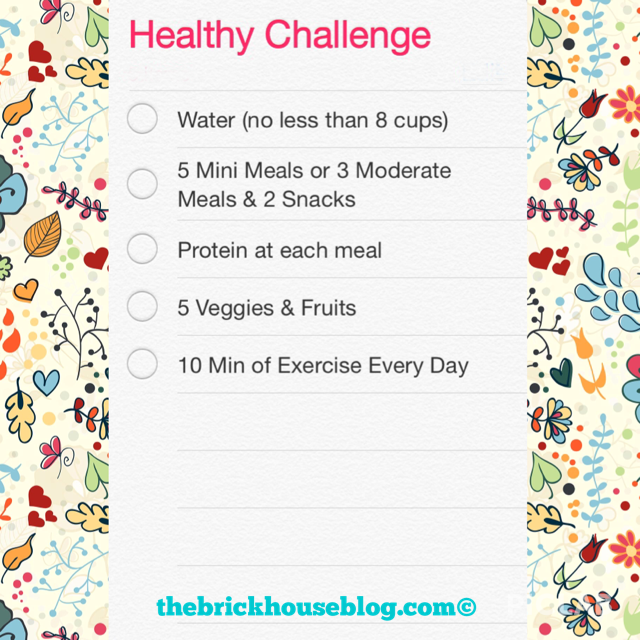 Look on Google or Pinterest under Fitness Challenge to find many month long challenges. Additionally, I ride my bike several times per month, between 10-15 miles each ride. This activity compliments running very well because it uses slightly different muscle groups that support the running activity. I highly recommend using a bicycle as a supplementary activity. In the beginning, it may be harder than you remembered as a kid! We don’t forget how to ride, but suddenly it isn’t as easy as it once was! Start small, and build up! You can track your ride on MapMyFitness as well. Pick your pleasure. There is a great big world out there of options to begin your active lifestyle. The health benefits are vast, beginning with strengthening your heart, removing toxins from your body, improving digestion, increasing circulation to all of the limbs, and elevating mood by way of endorphins. All of these are in addition to building muscle and strengthening your bones. *Disclaimer: Please consult your physician before beginning any exercise regimen. This information is offered as suggestions and encouragement. The alarm goes off before the sun, feet hit the floor and go until we collapse into bed at night. Many of our meals get eaten absentmindedly, while checking emails or behind the steering wheel. Guilty, guilty, guilty of this, almost on a daily basis. So how is a trying-to-stay-healthy-gal supposed to survive this may-I-take-your-order culture? Planning, re-routing and packing. For years, the kids’ activities have kept us on the go. In effort to stay on budget, we have become accustomed to packing coolers for the day. Occasionally, we have to get things while we are out, so it is important to know what could be good options on the go. I will try to offer some options for you! If I had only 10 minutes to go grab some food for the family, rather than drive-thru, think about what you can grab at the grocery store. First, hit the produce section. Having a water bottle on hand can serve as an emergency produce wash. In the produce section, many carry mixed nuts in bulk containers. Look for ones that are not roasted in oil, sweetened or coated. For my family, I buy the big bags of roasted peanuts in the shell. Nuts in the shell are great for portion control, because the shells show you how many you are eating. Plus, you cannot just throw the nuts in your mouth by the handfuls! Dried fruit and/or trail mixes are not likely to be your best choice unless you are very careful to select the type that has not been sweetened. Raisins are good, most dates are good, and apricots. Most other dried fruits are coated with dextrose or some other type of sugar. Trail mix was designed to offer a significant amount of energy for those back-packing/trail-trekking folks. If you are not doing that sort of activity, chances are you will just be storing all that extra energy, aka: putting on the pounds. Granola is the same sort of a beast. To make it tasty, it is sweetened with a variety of additives. Rotisserie chicken (high in sodium, but a decent option if you are on the go) If needed, see if the associate can cut up the chicken for you. Hummus is great to dip the carrots, raw green beans, peppers and raw sugar snap peas. Now for the dairy section. I am VERY brand/ingredient selective in the dairy case. So many of the yogurts and cheeses have way too many additives in them, which work against your weight loss process. Many of them include starches and stabilizers to lengthen the shelf life. Greek yogurt- I am going to camp here for a minute. Greek yogurt is a protein powerhouse, when it is the actual traditional Greek variety. This means that the yogurt has been strained to release additional whey liquid and the consistency of the yogurt is much thicker. 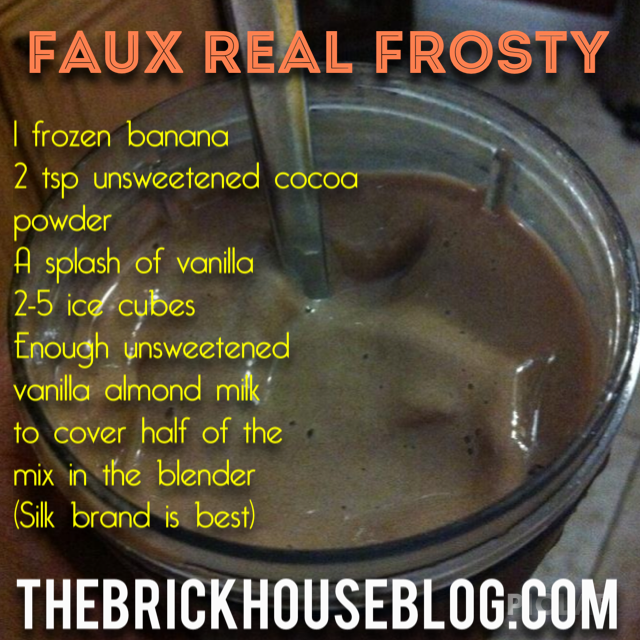 This allows for a denser amount of protein per ounce. Read the ingredient label carefully. The best brands will only contain milk, live and active cultures (must say this or it does not contain the needed good bacteria). Many brands will add whey protein powder, potato starch, guar gum or other fillers. Good brands are Fage, Chobani, and even the Winn Dixie brand is good. For weight loss, it is better to select the plain yogurt and add your own fruit, crushed pineapple, honey, or a tsp of Polaner (unsweetened) All-Fruit spread. Most fruit-flavored yogurts use high fructose corn syrup in addition to sugar. These will work against you in weight loss. Cottage cheese- As stated above, several varieties contain unnecessary fillers. Daisy cottage cheese is a good, clean variety that you can trust. Snyder’s pretzel sticks is one of the better brands, containing no high fructose corn syrup, however, they are made with enriched flour (not whole grain), and so these are on my “occasional” list. Barbara's Bakery Fig Bars, Multigrain may not be sold in all stores, but you can find them here. Traditional fig bars consist of a large amount of high fructose corn syrup, but Barbara’s are sweetened with pineapple juice and are made of whole grains. Popcorn kernels for homemade microwave popcorn. (1/4 cup of kernels in a brown paper bag, fold the top down 2 times. I use the popcorn button on my microwave and it comes out perfect every time. Pour the popcorn in a large bowl, spray lightly with olive oil cooking spray and dust with sea salt, cayenne pepper, garlic, or parmesan cheese). Allow it to cool completely and put it in an airtight container for on the go. Unsweetened applesauce is good, but READ THE LABEL. Most of them are sweetened. Keeping fresh foods ready to eat in BPA Free Plastic Containers help to make busy days easier. Do you have any other great ideas that you use? *This post contains affiliate links to products that I love!